The sheer scale of the human cost of the recent earthquakes and tsunami in Japan is yet to be calculated and many people in the country are still hoping to find missing loved ones. Google launched Person Finder within hours of the disaster occurring and now YouTube is offering its support too via a tool that lets you search through missing person appeals. 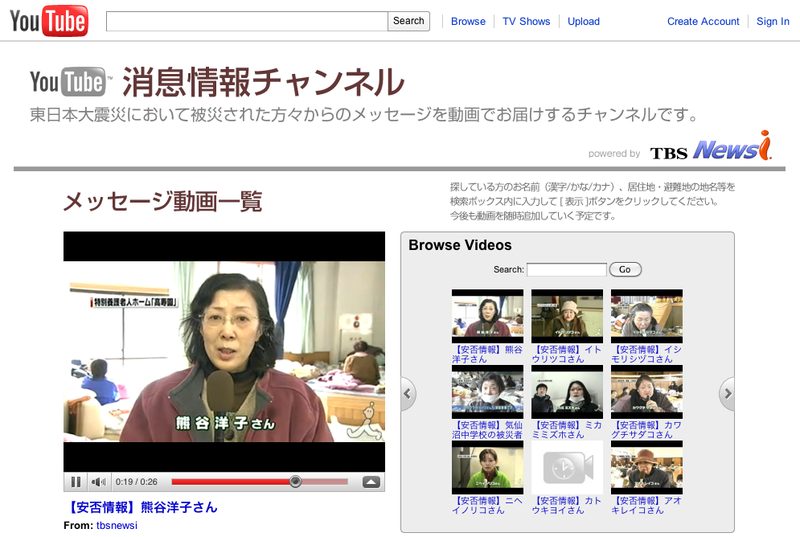 The simple Shousoku website features videos shot by Japanese TV station TBS in shelters for those without homes. Over 80 TBS videos are being uploaded and YouTube says that similar appeals from other networks will be added in the coming days. The search box only supports the Kanji, Katakana and Hiragana character sets used in Japan, so there’s no way to search using Romaji (English characters). That shouldn’t be a problem for most of those it’s aimed at of course, and it’s good to see another useful tool emerge to help connect those separated by the tragedy.